Walking With God ebook now on sale on Amazon Kindle! Don’t you love great deals? I do, too! Technology is changing fast, especially changing the face of writing and publishing. 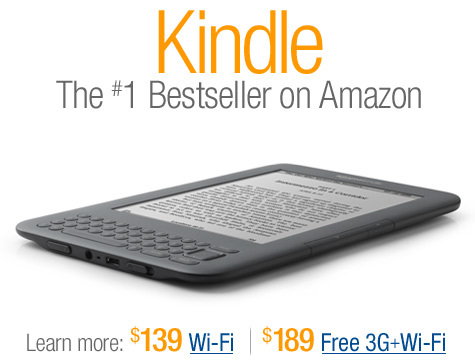 One hot trend right now is putting your ebooks, special reports, and tip sheets on the Kindle. One of the greatest deals right now are ebooks on the Kindle. Lots of well-known authors are putting their ebooks on the Kindle for sale at incredibly low prices. I have been praying about this, and this week I made a decision to put my baby, my ebook Walking With God, on the Kindle. It is now available on the Kindle for the ridiculously low price of 99 cents! I will not keep it at this rate long, so if you, family, or friends have a Kindle, now is the time to get my ebook at a great price! You can purchase my Kindle ebook Walking With God right here. After the purchase, it’d also really help me out for you to put a favorable customer review on my Amazon page, and rate it (the more stars, the better!) My friend Susan Evans already has an excellent customer review on there. Be sure to tell all your family and friends! Do you have ebooks, special reports, or other documents you’d like published on the Kindle? You can also add an Author page at Amazon Author Central, your RSS blog feed, and videos on Amazon for more exposure of your website! Below is Denise Wakeman’s instructional video, showing you how to upload and publish your ebook on the Kindle. It takes Amazon about 24 to 48 hours before it goes live, and you do not have to have an ISBN number to do it. She makes it real simple and easy to understand. PS: The link to purchase my Kindle ebook Walking With God right here. ← Camtasia training video – your thoughts?